Changtse (Tibetan: "north peak") is a mountain situated between the Main Rongbuk and East Rongbuk Glaciers in Tibet, China, immediately north of Mount Everest. It is connected to Mount Everest via the North Col. The given elevation of 7,543 metres is from modern Chinese mapping. Some authorities give 7,583 metres. 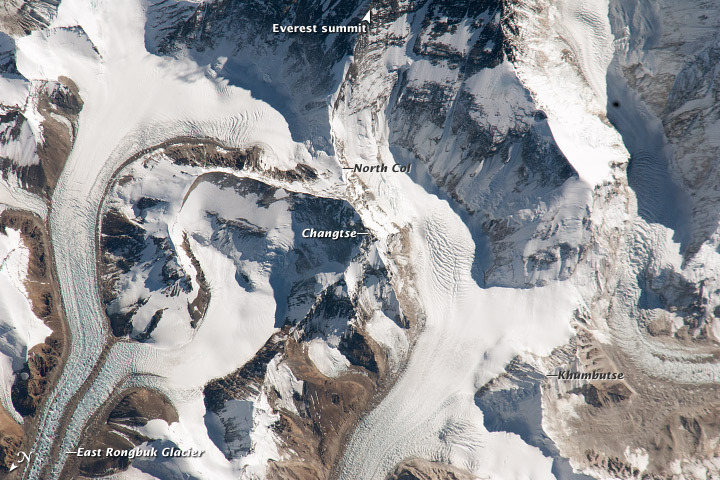 The Changtse Glacier flows north into the East Rongbuk Glacier. It is possible that the third highest lake in the world is in the Changtse Glacier at 6,216 metres (20,394 ft). 1924 George Mallory and Andrew Irvine first to set foot on Changtse. They climbed the east ridge of Changtse to reconnoiter camp sites on the East Rongbuk Glacier. 1935 During the Mount Everest Reconnaissance a team with Eric Shipton, Edmund Wigram and Bill Tilman attempted the North Peak from their Camp IIA . On August 21 they got to within 1,500 feet (460 m) of the summit before very deep and soft snow forced them to turn back. 1952 Reconnaissance of Changtse via Changtse Glacier by Edmund Hillary and George Lowe and a group of Sherpas. They reached an estimated elevation of 21,500 feet (6,600 m) before turning back after running low on supplies. 1982 The first ascent of Changtse was unofficially made on October 3, 1982 by Johan Taks of the Dutch Everest Expedition who were officially climbing Everest from the north side. However, Taks climbed Changtse without a permit. 1982 The first official ascent of Changtse with a permit was completed 11 days later on October 14 by five members of a German expedition Udo Zehetleitner, Paul Braun, Rudolf Frick, Ludwig Hösle and Martin Engler. The ascent was made via the four kilometre-long NE Ridge from the junction of the East Rongbuk Glacier and Changtse Glacier. 1983 The next ascent and also the first solo was made by Chilean climber Gino Casassa May 14, 1983 by the same route used by the Germans. 1986 Changtse was climbed again by a large Chinese-Japanese expedition in 1986. This expedition put eight Japanese and 16 Chinese on the summit May 10 and May 11, 1986 again via the NE Ridge from the Changtse Glacier. Also included the first ascent by a woman, Mrs. Gunsung. 1987 Australian climbers Rob Turner and Glen Nash reached the summit September 29, 1987 via the north face icewall (Japanese 1986 route) despite high winds. ^ The Highest Lake in the World: 3. "Changtse Pool"
^ Tony Astill, Mount Everest: The Reconnaissance 1935, pp. 266-67. ^ Louis A. Whitton, The American Alpine Journal 1988, pg. 272. ^ Wild Issue 28 (April 1988), pp 33-36. This page was last edited on 1 June 2017, at 00:52 (UTC).